Mercy Hospital wants to provide better care for its patients -- by making sure they don't come to the hospital. 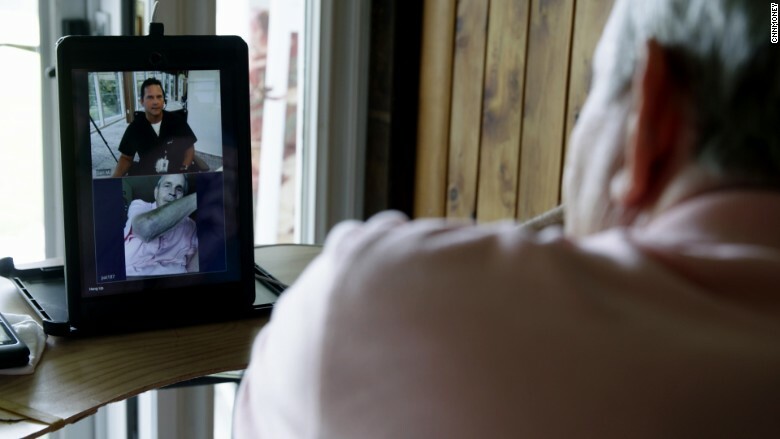 Instead, 330 staffers at Mercy's Virtual Care Center, located just outside of St. Louis, place video calls to patients using highly sensitive two-way cameras -- and monitor their vital signs in real time through tools like pulse oximeters that plug into an iPad. Under new federal guidelines, hospitals are partly responsible for keeping costs down. So they're turning to video chats, email and other online communications to keep patients out of the ER whenever possible. "The sickest 5% of patients are typically responsible for about half of the health care spent and many end up, unnecessarily, back in the hospital," Gavin Helton, the medical director of Mercy Virtual Care, told CNNMoney. "We need an answer for those patients." Mercy says the Virtual Care Center, launched in October 2015, is the first of its kind: a $54 million, four-story "hospital without beds" that houses zero patients. It's home to a variety of "telemedicine" programs that allow Mercy to care for patients remotely round-the-clock. "When I was a kid, when you were sick the doctor came to your house," Strubberg told CNNMoney. Times have changed, and Strubberg lives on a cattle farm in New Haven, Missouri, more than an hour away from Mercy St. Louis. So Mercy enrolled Strubberg in the in-home care program. He now talks with Mercy Virtual Care staffers, called "navigators," twice a week. The navigators video-call Strubberg on his hospital-supplied iPad and ask the same questions they would during an in-office visit: How are you feeling? Have you been taking your medicine? What hurts? 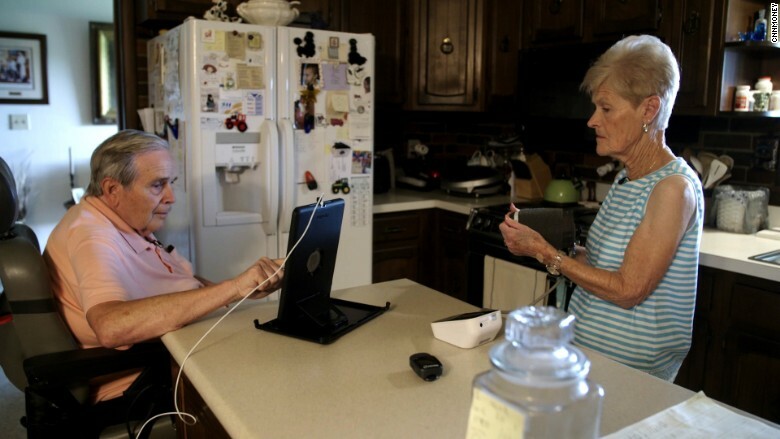 The navigators also direct Ruth Ann, Strubberg's wife of 59 years, to use equipment like a blood pressure cuff that connects to the iPad. "Once, I felt like I was maybe having congestive heart failure because I couldn't breathe; my lungs were filling up," Strubberg told CNNMoney. His main Mercy navigator, Dan Milner, assessed his vital signs remotely and determined he wasn't having a heart episode. He simply needed a new medication. Then, just last month, Strubberg suffered a bad fall while using his walker. Strubberg's left side began to bruise immediately. His ribs ached; he could barely breathe. 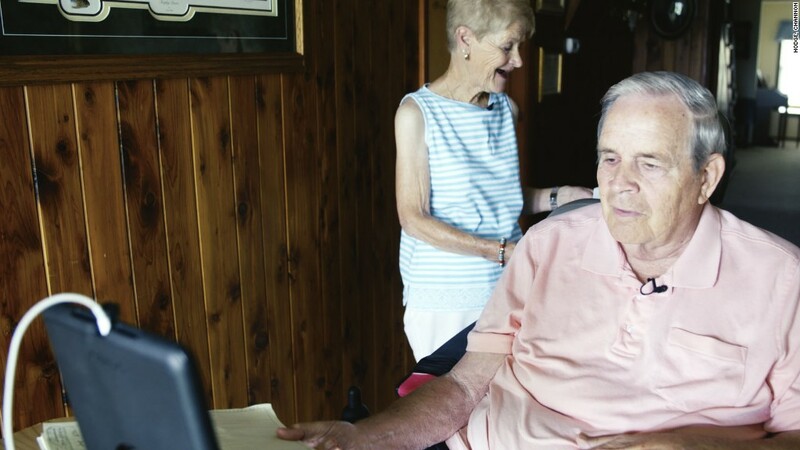 Ruth Ann was ready to call an ambulance, but instead the Strubbergs called Mercy Virtual Care. Milner inspected the bruising on the video call and directed Strubberg to try a variety of movements. Milner concluded Strubberg hadn't broken any ribs and sent recommendations for care at home. To make programs like Mercy Virtual work, navigators must do "a lot of thinking outside the box," Milner told CNNMoney. "You have to break that whole clinic kind of thinking with nursing: 'Oh my gosh, he needs to go to the ER," Milner said. "[There's] an antiquated idea of how people think healthcare should be." But not all patients welcome that kind of disruption. Milner recalled a 99-year-old woman who became so overwhelmed and upset by the technology that "we told her to take the iPad and put it in a drawer," he said. For that patient, Milner now conducts sessions over the phone and has a family member take and report her vital signs. "There's struggles in every single step of the process," said Megan Donovan, another Mercy navigator. For example: It might take a patient 15 minutes to find the power button to turn on their iPad, she said. That unfamiliarity can be a huge hurdle, said Gavin Helton, the Mercy Virtual medical director: "Many of these patients have never held a tablet before. For them, that's scarier than getting their chest cracked open." Beyond helping patients get comfortable with the hardware itself, it's key for navigators to build trust, Donovan said. "It's harder to trust someone when you've actually never met them," she said. "We really have to spend a lot of time to getting to know them. I know their family members, I know what they do for fun. I know what their dogs are named. You have to really make them feel comfortable with you." Not everyone believes virtual-care technology has a place in health care, however. Critics of telemedicine are concerned about "continuity of care," saying that patients may receive care from different navigators each time they call, and primary care doctors may be looped out of important health discussions. Working through the challenges is well worth it, Helton said, given the opportunity that virtual care represents. Mercy credits the Virtual Care program with a more than 33% decrease in emergency room visits and hospitalizations since last year's launch. Doctors have "come full-circle" back to the days of house calls, Helton said, albeit with a modern twist. "As opposed to bringing the little black bag into the home, we have tablets, we have biometric sensors, we have triage software," Helton said. "But we're still providing that personal touch. It's a patient-focused approach."